If someone says, “you can’t teach an old dog new tricks” they haven’t met Stephanie Bennett. When Stephanie first came to Houston we engaged her services because I had a middle-aged Yorkie who did not want my boyfriend anywhere near me. We kept a dog-bite kit nearby at all times because I wasn’t getting rid of either my Yorkie or my boyfriend so we figured dog bites were just in our future. After spending time with Stephanie, she turned the situation around so much so that our 16 ½ year old Yorkie slept in her “daddy’s” arms as often as she possibly could. Stephanie taught us how to bring the best out of our already spoiled little pup and clearly improved her life so she could relax and enjoy being part of our little pack. Now we are getting a new puppy and the first thing we are doing is getting Stephanie involved in every aspect of our early training so we can bring this little pup into our family on the right foot. We wouldn’t trust our pups to anyone other than Stephanie. She has taught us a great deal about being responsible, happy pet owners. We want only the best for our pups and Stephanie is the best. We are strong Believe In Dog Training supporters! We are so excited about your new venture! I can't believe it has been over ten years that you have been sharing your incredible talents and wisdom with us and (back then), our two Bichons. You taught us that it is never too late to teach an old dog new tricks and that behavior issues can be fixed with proper training. 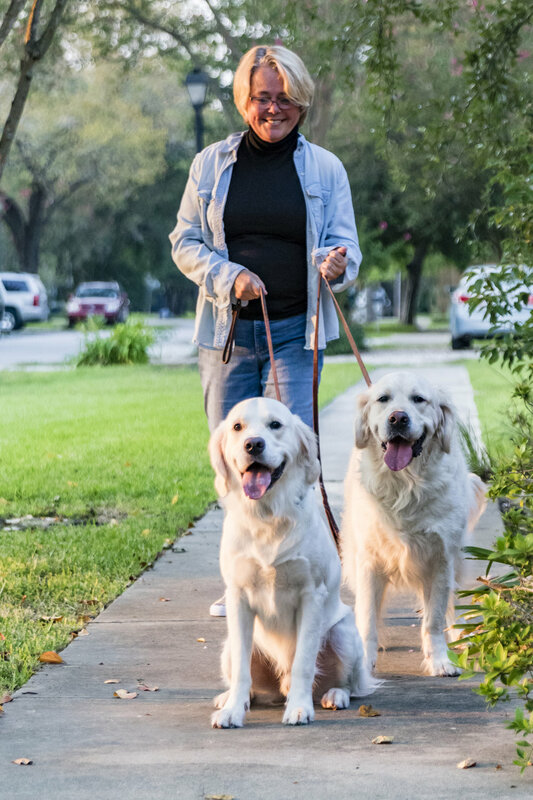 Now with our two Sheepadoodles, Daisy & Dash, you have helped us with puppy training from day one all the way through Therapy Dog Certifications. Your knowledge, patience and skills are second to none, and you have made all the training we have participated in very worthwhile and fun at the same time. You are truly at the top of your game and we are all excited to take part in your new business! Our dogs are now 1.5 years and 3 years old and we are happy to say that both dogs attended several of the classes taught by Stephanie Bennett. We have taken the boys to puppy pre-school, Puppy I, Puppy II, Stay & Place Workshops, Puppy Socials, Adventure classes to the beach, the Sam Houston Park, Clicks and Tricks, Sherlock Nose and Therapy Dog preparation classes. So it would be fair to say we have experienced many of the excellent programs that Stephanie Bennett has to offer. Her training programs are not only unique, but the puppy programs truly do help your dog grow into a well socialized and well behaved dog. Much of the puppy classes focus on socializing your dog, and ensuring that you and your family can enjoy the dog including him/her in many activities. Our whole family is so grateful to Stephanie for helping us learn how to work with our dogs, and how to be consistent and persistent under all circumstances. Stephanie calls that calm persistence! We believe it is because of Stephanie that our dogs are so well behaved and mellow. Honestly we are amazed at what they have learned in their classes. Everything they learned in the classes continues to be reinforced as a result of Stephanie training our family best practices as well. Stephanie always has the dogs safety and well-being in mind during each of the classes. She always tailors classes and certain training exercises to fit the needs of each dog to ensure his or her success. Stephanie helped all of us understand the way our dogs learn, and how we can help them to be successful. Stephanie trained us so we can continue to train and practice with our dogs long after the classes have ended. If you are considering a dog trainer or puppy day-school, I cannot recommend Stephanie Bennett highly enough. She is so helpful and you will love the positive training approach she takes with your dog. Stephanie is such an amazing dog trainer. When I first decided to get a Labrador I knew that I needed a great trainer. They can be a little tricky to control if you don't have the right foundation built. Kingsley was my first big dog so I wanted to do everything right. I searched for days to find a good trainer. All I knew was I wanted training to be fun and personalize. I finally found Stephanie in a magazine and decided to give her a call. That was one of the best decision I have ever made for my pup. We started training when he was 8 weeks old. I say "we" because Stephanie truly believes that the owner must be fully devoted in order to make progress. She is always so reassuring and was alway happy to see Kingsley and I. At first Kingsley wouldn't walk on a leash so Stephanie showed me how to make the leash more enjoyable for him. After a lot of practice he became a pro at walking on a leash. Kingsley is almost two now and he is the most well behaved dog anyone could ever ask for and I give all the credit to Stephanie. She made training fun and positive which is all I really wanted, but I got so much more. I got an amazing dog with good manners. Stephanie just signed off on his CGC certification and that was such a huge accomplishment. She was such a huge part of Kingsley's life that he can spot her from a football field away. He is absolutely in love with her and that makes me so happy. Stephanie has helped me with every little problem that I have ever had with him and I'm 100% sure she will be there for my future fur-babies as well. Thank you Stephanie for all the time and dedication you took on helping me make the perfect dog. When I got my dog Friday 4 years ago, my friend recommended Stephanie. I had never had a dog before, and Stephanie came to my house to make sure I was ready to add a dog to my household, with the supplies, basic training, etc. Her group puppy training curriculum had more than the basic foundation for obedience - it included socialization with other dogs and people. I learned how to communicate with my dog, and it also was a great bonding experience. Since then, I have loved Stephanie’s creativity with her adventure series classes - a lot of fun and new experiences. The best result is that Friday is a happy, friendly dog and is comfortable with different people, different dogs and different environments - whether going to the beach, the hill country, or the lake - she gets to have fun and is well-behaved. I am so grateful to Stephanie for everything she has taught me. I rescued a 7 pound Chihuahua/Terrier mix, Henry. He LOVES people and LOVES playing with other dogs. Everything was great right off the bat with one noticeable exception. When I would walk Henry on his leash, he would become extremely aggressive each time he saw another dog. He would lunge at other dogs or bark hysterically. The dog could be 2 feet away or 2 blocks. I found Stephanie through Animal Justice League (rescue group where I found Henry), and I decided to give her a call. After meeting with Stephanie, she let me know that I was not alone, and that many other dogs react aggressively when on a leash when encountering people, dogs, bicycles etc… Stephanie helped me to understand that his reaction is because he is uncomfortable or upset, and that through a science based approach in training that we could help to minimize his reactivity when on our walks, and that they can be fun and not have to be a frustrating event each and every time. My hope in writing this review is that if you have a leash reactive dog, I want to encourage you and let you know that there is hope! With Stephanie’s help, I have a structured plan in place to help Henry move towards a place where he is learning that walking on a leash can be ok. It is a lot of hard work for Henry, and it is also a lot of hard work for me. Sure, it is extremely frustrating at times. Sure, I want to throw in the towel sometimes. Stephanie has worked with me just as much, if not more, than Henry so that we can set Henry up for success. I can’t even describe the joy that I get to share with Henry when we make small strides of progress. Henry and I’s bond is growing. His anxiety is lessening. He is starting to truly enjoy going outside and doing his trot of confidence for the world to see. The times where I wanted to give up, Stephanie encouraged me not to, and to trust the process. I simply cannot say enough about my experience with Stephanie. Henry and I would not be where we are today without her. Today I get to go on long walks with Henry, and we both get to enjoy it! Stephanie Bennett's training helped us tremendously when our son Alex, was born. I was so stressed that our dog, Lucky would not like Alex and we didn't know what to do with them. After the lessons at home with Stephanie, we learned how to build better bonds, how to give enough space to Lucky, how to teach Alex to respect Lucky... Today they love each other like brothers! Thanks again Stephanie! You are the BEST! Our Goldendoodle, Zipper, is a quite fit, high energy, hot mess! And we are totally, head-over-paws in love with her. I wonder if we would feel as enthusiastic about this “dog of our life” were it not for Stephanie’s training. Zipper has benefited from 2 puppy classes, a tricks class, and private lessons with Stephanie. Our past experience with dog trainers is that they often are better with animals than with people. Stephanie is a pleasant exception to this stereotype—she’s equally good with people. The training is positive (no shaming) and focusses on providing skills and strategies to help communicate to your dog what it is, exactly, that you are asking of them. And it works! At about a year and a half, Zipper became very “leash reactive” (barking at other dogs when on a leash). With the skills Stephanie taught us, and a lot of follow-up on our part, this problem isn’t really a problem anymore. We’ve been practicing alternative behaviors and Zipper has gotten as good at them as she was with the old ones—the ones where she barked her fool head off every time she saw another dog. Now, with treats and practice, Zippers eyes are on us and the presence of another dog across the street just doesn’t seem to be an issue for her anymore. There’s only one situation for which I would not recommend hiring Stephanie; that would be if you don’t have a dog. When I got my new puppy from a rescue, I made the resolution that “this” dog (as opposed to my poorly trained previous dogs) was going to be well-trained. I received a number of recommendations for trainers from friends, but I made my selection when I learned about Stephanie Bennett’s philosophy/curriculum of positive reward, science-based training. It follows current training philosophies, is not punitive, and makes perfect sense. But, of course, the test was if it worked. Aki and I have now gone through multiple training courses and adventure classes under Stephanie’s training plan. I’m so happy to say that, “YES”, her training style is exactly what I was hoping to find. Not only has it been effective in helping him to be a well-behaved dog, but more importantly, Stephanie has made sure that my dog, Aki, continues to enjoy every training session. He is so excited, whenever he sees her, because he has no idea that he is training. He’s just having a great time. But at the end of the session, we always accomplish something. Like all good teachers, she’s innovative and creative in developing her training programs. She doesn’t force a “one-size, fits all” approach to every dog, but rather makes sure that his training is tailored to incorporate the strengths of both his and my personalities, which helps to ensure that our goals are achievable. And once we learn the basics, she offers supervised opportunities that allow him to practice his skills in “real life” situations. 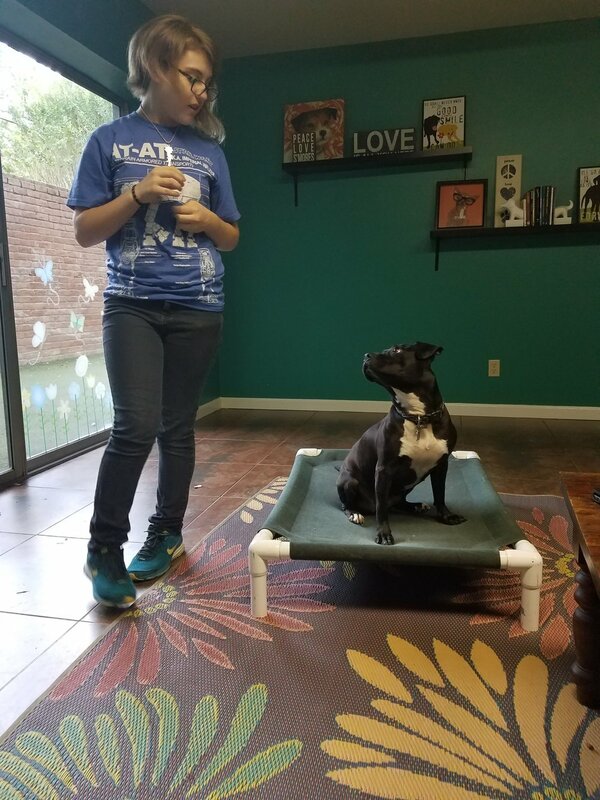 If you want to have an effective, positive, and enjoyable training experience for both you and your dog, Stephanie Bennett’s Believe in DOG Training is the perfect place for you and your dog. I cannot be grateful enough to Stephanie for all her help and support. Thanks to her Believe in Dog philosophy our dog has a very impressive achievement wall, having completed puppy 1 and 2, tricks, nose work, CGC, and some other classes and adventures around the city, he's even part of a therapy dog group. When we came to Stephanie we were frazzled. I don't know how else to describe it. Two years prior, we adopted a bitty pittie who we named Freya Froglegs. She was found by a friend of ours in a dog park. She had heartworms and a nasty uterine infection after having clearly had a couple litters even though she was very young. From the start she was a rambunctious little thing, but she was also the biggest snuggle bug on the planet. She and my hubby fell instantly in love and we adopted her. Freya immediately tried to establish herself as the pack leader which created a lot of tension in the house. After she attacked one of our dogs twice we sought outside help with The Texas Dogfather. He really helped us better understand her behavior and for a long time after Freya returned home we had no issues. Then in a short span of time, she attacked our dog again and bit me twice. We were really distraught and took her back to The Texas Dogfather, and once again when she came home she was better, but we knew we could not live with the constant worry that we were feeling. Initially we thought that we must not be the right owners for her, that we should probably help her find another home where she would be happier, but we also didn't want to put any two or four legged friends at risk as Freya was so unpredictable. But we also love and adore her, and 99% of the time we have an amazing dog on our hands. Feeling defeated, we reached out to Stephanie as a last resort, and I am so glad we did. While Freya was timid at first Stephanie quickly earned her trust and on our second and third visits Freya could not wait to get out of the car. Stephanie really helped us learn how to work Freya's mind and how to get her to play and think. She taught us about high reward treats and puzzle toys. We were keeping the dogs apart all the time which made life really difficult, and she helped us get comfortable with using a "party hat" to keep everyone safe while allowing them to be together. Finally, she encouraged us to talk with our vet about some other alternatives to dealing with Freya's anxiety and issues. Had we not found Stephanie, I think we would all still be walking on eggshells 24/7. We will continue to work with her regularly throughout Freya's life as she is the reason we still feel comfortable keeping Freya with us. Bottom line, I cannot recommend Stephanie enough!